CHARLOTTE – National Agents Alliance believes in three things: Having Fun, Making Money and Making a Difference. When Barbara Bradley walked on stage at National Agents Alliance’s “Fight To Unite” National Convention at the Charlotte Convention Center, it was clear The Alliance was helping the efforts of Duke Children’s Hospital & Health Center. Barbara Bradley shared her daughter, Katie’s story. Katie is a brave little girl that was diagnosed with hemimegalencephaly – a rare neurological disorder in which one side of the brain is malformed and abnormally larger than the other side – at 18 months old. This condition creates numerous seizures. 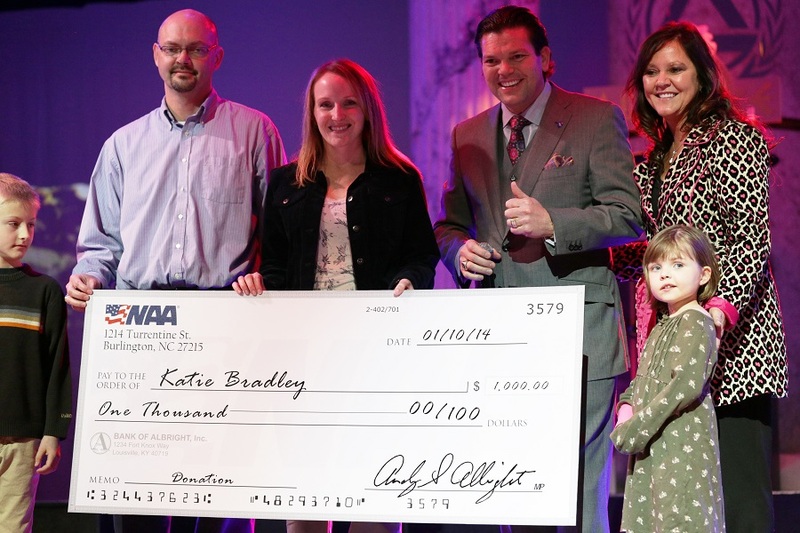 After her mother shared her story, Katie Bradley walked on stage with her parents, her older brother, National Agents Alliance President and CEO Andy and Jane Albright, Alex Fitzgerald and Bill Lampe to a standing ovation from The Alliance. Jane Albright smiled as she kneeled beside of Katie, who gladly took the microphone and played a game of “High-Low” with the audience. When Katie said “high,” everybody reached their arms up. When Katie said “low,” the audience took her direction. Andy Albright told the Bradleys how much The Alliance believes in making a difference and told the family they wanted to start a savings account for Katie. The family was presented with a check for $1,000 and another check was donated to Duke Children’s Hospital for $1,000 to aid their research and groundbreaking work. Katie Bradley walked up the steps and off the stage to a standing ovation from The Alliance. From birth, Bradley experienced developmental delays. Her verbal communication and motor skills were not developing as fast her older brother’s had. This wasn’t a concern until Bradley had her first seizure at 18 months old. Doctors tried to control the seizures through a series of medications. Bradley’s parents would stay up at night using a baby video monitor to watch her. At times, the seizures were so severe that she would turn blue from not breathing. “She was just not able to function and it was like we lost a year of her life,” Barbara Bradley, Katie’s mother, said. After seeking advice from the neurosurgery team at Duke Children’s Hospital & Health Center, it was clear that surgery was the only option for Bradley. Five days after her birthday, Bradley began having seizures every 10 minutes. This forced the team at Duke to move her surgery up a month. She required in-patient care at Duke and around-the-clock monitoring. The challenges persisted and Katie’s health worsened. In her first week at Duke, Bradley coded twice because she was unable to breathe. Bradley now lives with half a brain and has been seizure-free since the doctors at Duke performed multiple surgeries to prevent future seizures. “Because of the amazing doctors at Duke Children’s, my Katie has a quality of life now,” Barbara Bradley said.